Apple has released an upgraded MacBook Pro line Thursday that’s faster and has more features, targeting its loyal base of professional users like app developers and movie editors. The new laptops, which come in the same 13-inch and 15-inch sizes as last year’s models, include pro-focused upgrades like additional memory and storage, the ability to compile code faster, brighter screens, and quieter keyboards that some users have often requested since the latest MacBook Pro design was announced in 2016. Apple says the larger new MacBook Pro is as much as 70% faster than the previous model, while the smaller version is up to twice as fast as its predecessor. “The latest generation MacBook Pro is the fastest and most powerful notebook we’ve ever made,” said Phil Schiller, Apple’s senior vice president of worldwide marketing, in a statement. The new laptops include screens with True Tone technology, which shifts colours automatically based on the surrounding physical environment. Apple also added an updated custom chip called the T2, which provides better security and brings the voice-controlled “Hey Siri” option to the Mac for the first time. The Macs also include updated Intel processors. While sales growth of iPads has slowed in recent years, the Mac line has remained fairly steady. Apple sold 19.3 million Macs in 2017, or close to the amount the iPhone maker sold in each of the three prior years. Apple was criticised by professionals for recent Mac upgrades, but it has since taken a renewed approach to professionals and has been praised for its newest announcements. Apple held 6.9% of the PC market in the first quarter of 2018, according to Gartner, trailing 21% for HP, 20% for Lenovo and 16% for Dell. 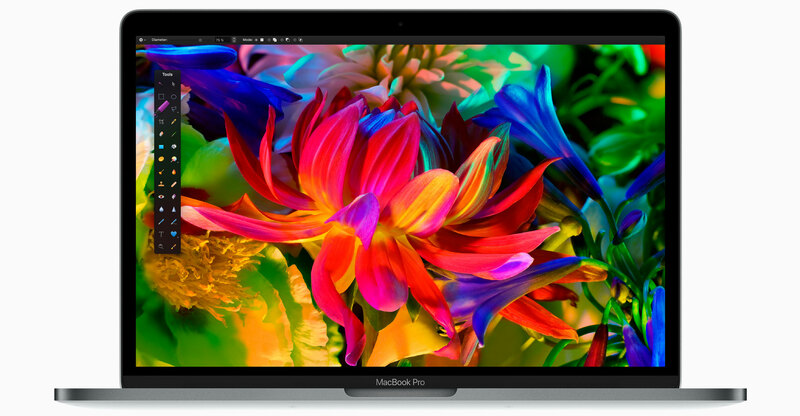 The updated MacBook Pros come ahead of a significant product blitz for Apple. This spring, the Cupertino, California-based company plans to introduce three new iPhones — an update to the iPhone X design, a larger iPhone model that looks like a giant iPhone X and a low-cost model with iPhone X features like Face ID — upgraded iPad Pros with Face ID, new Apple Watches with edge-to-edge screens and a new low-cost laptop to replace the aging MacBook Air. The smaller MacBook Pro starts at US$1 799 and the larger model at $2 399.